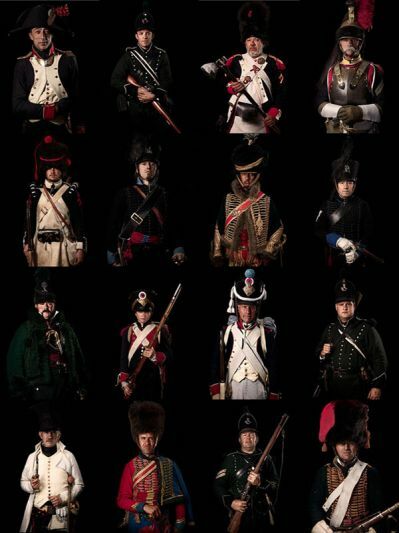 ‘Unseen Waterloo: The Conflict Revisited’ is an explorative photography series by Sam Faulkner that commemorates the 200th anniversary of the Battle of Waterloo. Its purpose is to capture imagery of the soldiers, as if photography had existed then. Faulkner, who specializes in documentary-type photography, traveled to Belgium for several years for their annual reenactment of the battle. He states that scrupulous detail resulted in an incredibly historically accurate wardrobe by International stage director and design Patrick Kinmonth. The exhibit features 80 life-size images on Giclée and Dibond using Metro Imaging’s Direct to Media printer. The prints are hung against a backdrop of Hainsworth fabric, creating haunting dark portraits of the men in battle.